Marilyn Minter (b. 1948) juxtaposes photorealistic paintings with painterly photographs and videos, honing in on the moment where clarity becomes abstraction and beauty meets the grotesque. Minter has recently turned her focus on the physical object between the camera and her subject, whether it is moisture, a pane of glass or graffiti. In 2015, a major museum retrospective titled ‘Pretty/Dirty,’ opened at the Contemporary Art Museum, Houston, and traveled to the Museum of Contemporary Art, Denver, Orange County Museum of Art, Newport Beach, and the Brooklyn Museum, Brooklyn. She has been the subject of numerous solo exhibitions including the San Francisco Museum of Modern Art, San Francisco; Center for Contemporary Art, Cincinnati; Les Rencontres d’Arles Festival (2007), France; La Conservera, Centro de Arte Contemporáneo, Ceutí/Murcia, Spain; Museum of Contemporary Art, Cleveland, OH; and the Deichtorhallen, Hamburg. 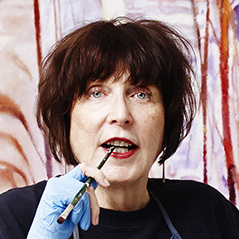 Minter has received numerous awards including the Planned Parenthood Woman of Valor Award (2016); Louis Comfort Tiffany Grant (2006); Guggenheim Fellowship (1998); New York Foundation for the Arts, Visual Arts Grant (1992); National Endowment for the Arts, Artist's Fellowship Grant (1989); New York Foundation for the Arts, Artist's Grant (1988). Her work is included in the permanent collections of many museums worldwide, such as the Museum of Contemporary Art, Los Angeles; Museum of Modern Art, New York; San Francisco Museum of Modern Art, San Francisco; Solomon R. Guggenheim Museum, New York; Whitney Museum of American Art, New York; Brooklyn Museum, Brooklyn; Louisiana Museum of Modern Art, Humlebæk; and Moderna Museet, Stockholm, Sweden; among others.